Up with the lark, or the condor at least, at Tupungato Divino (pictured). Drive south to Vista Flores to visit the astonishing neo-Incan complex of Clos de los Siete and ace viticuturist Carlos Tizio. Then taste a range of wines from the five bodegas and Clos de los Siete itself. Off to O Fournier at El Cepillo for a winery tour and a taste of the Tempranillo blends. If you’re running late, you will be glad of lunch at the restaurant, Urban. Head back north to Tunuyán and stop at La Posada del Jamón which specialises in cuts of pork. Sit on the terrace and try the salty jamón and the piggy ribs, sausages and black pudding, along with a crisp salad and a glass of Malbec. 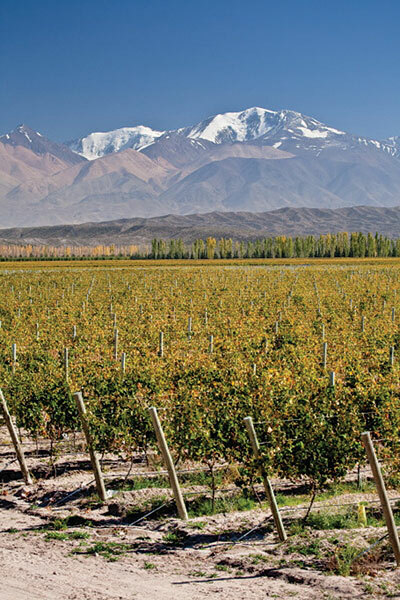 Double back to Tupungato and visit Salentein with its impressive underground circular cellars and taste the wines. That gives you just enough time to take in Bodega Atamisque, whose woods, ponds, lakes and streams is as close to out-of-this-world as you’ll get. Walk, cycle or horse ride, then visit the trout farm where David and Francisco will explain the different fish or catch you one for tomorrow’s lunch in its flower-festooned restaurant, El Rincón. Most of Uco’s wineries with restaurants are only open for lunch, so visit the incomparable Ilo in downtown Tupungato. In this traditional-to-thepoint- of-retro family restaurant, there’s a menu of more than 100 fish dishes, some of which may need translating. An extensive local wine list includes Dom Pérignon at around £75 at the black market rate. Head back to your cabin at Atamisque.